Ukraine’s SBU State Security Service together with Ukraine's military prosecutor's office has served notices of suspicion for eight Russian servicemen who attacked Ukrainian Navy seamen in the Kerch Strait on November 25, Spokeswoman for Ukraine's Prosecutor General's Office (PGO) Larisa Sarhan has said. 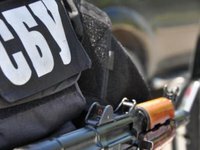 "SBU agents in Odesa region and military prosecutors of Ukraine's Southern region have served notices of suspicion to the below-mentioned servicemen of the Border Guard Service of Russia's Federal Security Service (FSB) and Russia's Armed Forces who attacked Ukrainian sailors under Part 2 of Article 437 (planning, preparation , unleashing and waging an aggressive war), Part 2 of Article 15 (attempted crime), Clause 1, Part 2, Article 151 (premeditated murder) of Ukraine's Criminal Code," Sarhan said on Facebook Tuesday. Sarhan said suspicion notices were sent at the place of service of those involved in Russia. A petition is being prepared for the court to elect a preventive measure. Suspicion notices according to Ukraine's Criminal Code were served for Rear Admiral Sergei Stankevich, Head of the Border Directorate of the Federal Security Service of the Republic of Crimea and the city of Sevastopol - under Part 2 of Article 437, Vice-Admiral Gennady Medvedev, Deputy Head of the Border Guard Service of the Federal Security Service, Head of the Coast Guard Department - under Part 2 of Article 437, G. Romashkin, Captain 1st Rank; Head of the Service of the FSB office of the Russian Federation for the Republic of Kazakhstan and the city of Sevastopol - under Part 2 of Article 437, Captain 1st Rank A. Shein, Deputy Head of the Department, Head of the Department of Public Administration of the FSB for Kazakhstan - under Part 2 of Article 437, Captain 2nd Rank A. Shatokhin, Head of the Service in the city of Kerch of the FSB control center for the Republic of Kazakhstan - under Part 2 of Article 437, Captain 2nd Rank A. Salyayev, commander of the frontier patrol ship Don - under Part 2 of Article 437, Captain 3rd rank A. Shipitsyn, commander of the patrol ship Izumrud - under Part 2 of Article 15, Clause 1 of Part 2 of Article 115 and Part 2 of Article 437 and Captain 3rd Rank S. Shcherbakov, Commander of the small anti-submarine ship Suzdalets - under Part 2 of Article 437. "On November 25, 2018, during the passage of the Kerch Strait, Russian ships launched dangerous maneuvers around the boats of the Ukrainian Navy in order to block the latter, and the Russian vessel Don rammed Ukraine's Yani Kapu tug, causing significant damage," Sarhan said. She added that after the departure of the Ukrainian ships from the 12-mile zone, Russian warships, namely the [Rubin Class patrol ship] Izumrud, continued their aggressive behavior and shelled the Ukrainian ships, wounding not less than three Ukrainian seamen and damaging two Ukrainian ships. "At present, the Berdiansk and Nikopol small armored boats [Gyurza-M-class] and Yani Kapu harbor tugboat, as well as 24 Ukrainian servicemen, have been captured by the Russian military occupation authorities," the report said. The Ukrainian law enforcement officers in the pretrial investigation established that the Russia's illegal aggressive actions against the Ukrainian sailors were carried out with the direct order and under the supervision of the Deputy Head of the Border Guard Service of Russia's FSB - the head of the coast guard department Rear-Admiral Sergey Stankevich and the head of the border department of the Federal Security Service of Crimea and Sevastopol vice-president Admiral Gennady Medvedev. "The abovementioned military personnel of the Border Guard Service of Russia's FSB and other military officials of the Black Sea Fleet of the Russian Federation coordinated and organized the attack of warships of the Russian Federation on Ukrainian sailors by shelling and ramming Ukrainian ships, resulting in the Ukrainian military being wounded and captured along with military equipment," Sarhan said.